Raytheon's SM-3 Block IB interceptor was launched Wednesday from the USS Lake Erie during a test-firing by the U.S. Missile Defense Agency and the Navy. The interceptor met its goal. A new missile under development by Tucson-based Raytheon Missile Systems intercepted and destroyed a short-range ballistic missile in a key flight test over the Pacific Ocean off Hawaii. In a test flight Wednesday, a Raytheon Standard Missile-3 Block IB fired from the USS Lake Erie destroyed a "complex, separating short-range ballistic missile target with a sophisticated separating mock warhead," the company announced Thursday. During the test Wednesday evening, the ship detected the target missile with its radar, calculated an intercept path and launched the next-generation SM-3 Block IB missile. The SM-3 maneuvered to a point in space and released its kinetic warhead, which moved into the path of the target's re-entry vehicle and destroyed it in a massive space collision, according to the Missile Defense Agency. 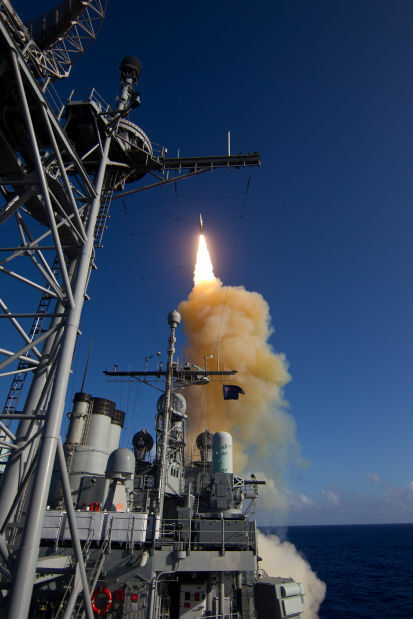 The Standard Missile is the business end of the Aegis Ballistic Missile Defense system, a ship-based interceptor system that is the core of the nation's Phased Adaptive Approach to missile defense of Europe. The flight test was the third straight successful test of Raytheon's SM-3 Block IB, after a target was missed on its first intercept attempt in September 2011. The latest test "should give us all great assurance in our nation's ability to take on a wide range of ballistic missile threats," Taylor Lawrence, Raytheon Missile Systems president, said in prepared remarks. The test featured "stressing conditions designed to challenge the missile's discrimination capabilities," the company said. Critics of the missile-defense program have contended that the SM-3 would have trouble hitting multiple, separating warheads. Raytheon SM-3 program director Mitch Stevison said prior tests proved the SM-3 Block IB against a solitary target, and against a separating target with debris. "This flight test continues to prove the robustness of the missile's discrimination capabilities against threats that are representative of what we'd see in wartime conditions," Stevison said. Data from the test will be used to support an upcoming SM-3 Block IB production decision, and Raytheon said it is on track to start deliveries in 2015. Raytheon's SM-3 Block IA interceptor is currently deployed on Aegis-equipped U.S. and Japanese warships around the world. Contact Assistant Business Editor David Wichner at dwichner@azstarnet.com or 573-4181.